I recently finished a modified version of Simplicity 3688. Wide-leg denim trousers from Simplicity 3688. Sandra Betzina’s zipper hidden in a pocket. Faux flat-felled seams and the use of topstitching thread. I used Palmer/Pletsch Pants for Real People as my guide. P/P fitting books recommend that you pin-fit the pattern tissue, then partially sew the garment and finish by fitting as you sew. Pin-fitting even reinforced pattern tissue seemed a little dicey to me, so I traced the pattern with Swedish tracing paper (which is really more like nonwoven interfacing than paper) and used the P/P fitting methods from there. I was really happy with the fit of the tracing paper version, but the fabric version somehow went awry. I think it’s because you fit only half the garment in tissue, and I didn’t end up with enough width by the time I cut it out in fabric and sewed the two halves together. P/P recommend 1-inch seam allowances, but I ignored that good advice. That would have saved the day. Instead, I sewed 3/8-inch seam allowances rather than the 5/8-inch allotted for a little more room. That improved the fit somewhat, and made all the faux flat-felled seams faster because there was no trimming necessary. I also goofed up their excellent method for fitting a waistband. You cut and pin the waistband to fit you the way you like. No measuring involved! Then you attached the pants to it. Well, you’re supposed to fit the INTERFACED waistband to your waist. I missed that part, so I fit a stretch denim waistband to my waist. When I added the interfacing, it wasn’t so stretch anymore, so it ended up too tight. (At least it was too tight right at that moment. I’ve since lost 5 pounds, and the waistband fits a lot better.) But I did use their special waistband interfacing and the technique that goes with it. I love it! It will definitely be my go-to for straight waistbands in the future. P/P have tips for fitting pretty much every figure variation you can think of. And it’s all illustrated in their book, showing real people and their real pants. But when I make — and fit — this pattern again (which I definitely will), I’ll make a muslin, then use their fitting methods from there. P/P are very successful with their pattern tissue fitting method, but I’m just more comfortable with fitting a sewn muslin. I do like the overall shape of the pattern, so I think it will be fantastic once I fit it to me properly. 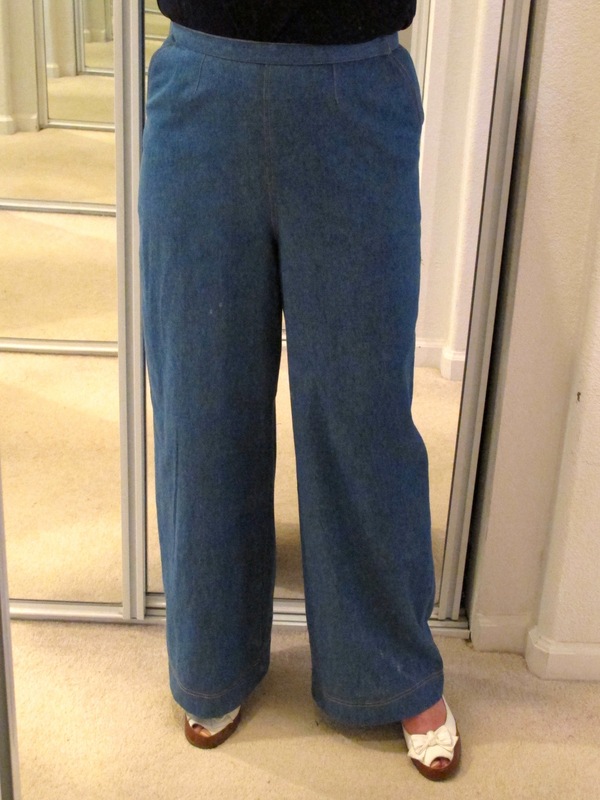 I wanted to make wide-leg denim trousers, but I didn’t want a center front fly. Too much bulk in the wrong spot! A back zipper on denim trousers just seemed wrong. But I also wanted side pockets. I hate not having a pocket to slip my phone or keys into. 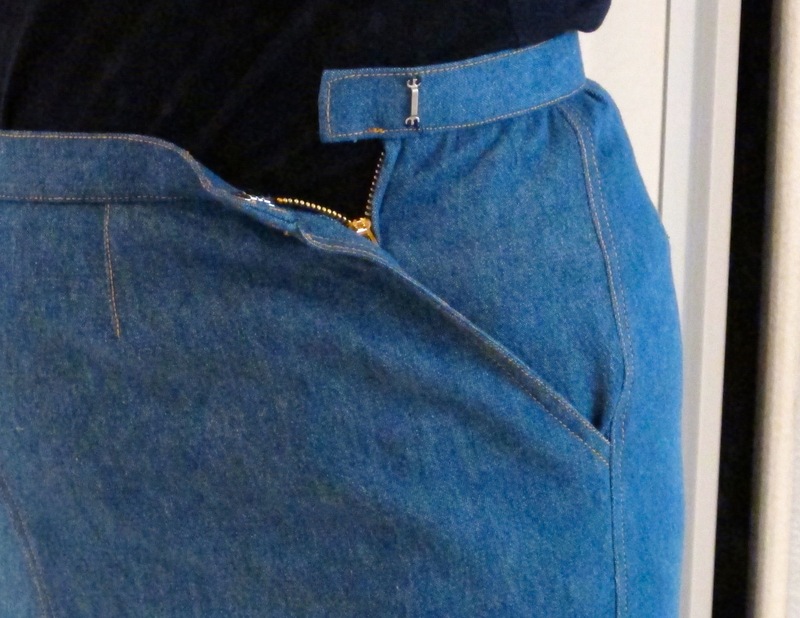 So I scoured the Internet for a solution and found a reference to Sandra Betzina’s method for hiding a zipper opening within a side slash pocket. It sounded well worth the investment in a used copy of her book Power Sewing, where she illustrates the technique. Genius! I had to give it a go. Well, what do you know? It worked. I’m not sure I love it, but it definitely worked. I bought both polyester and brass zippers because I couldn’t decide which to use. Once I was sewing, however, I knew I had to go with the brass for denim. It’s a little difficult to zip up pants inside a pocket, however. And with no back flap protecting my skin, I’ve nipped myself once or twice with those brass teeth. If the fit on the pants were better (say, looser), or I used a polyester zipper, it might be OK.
There’s a zipper opening hidden in that pocket! See the pulling at my tummy? All my pants do that. 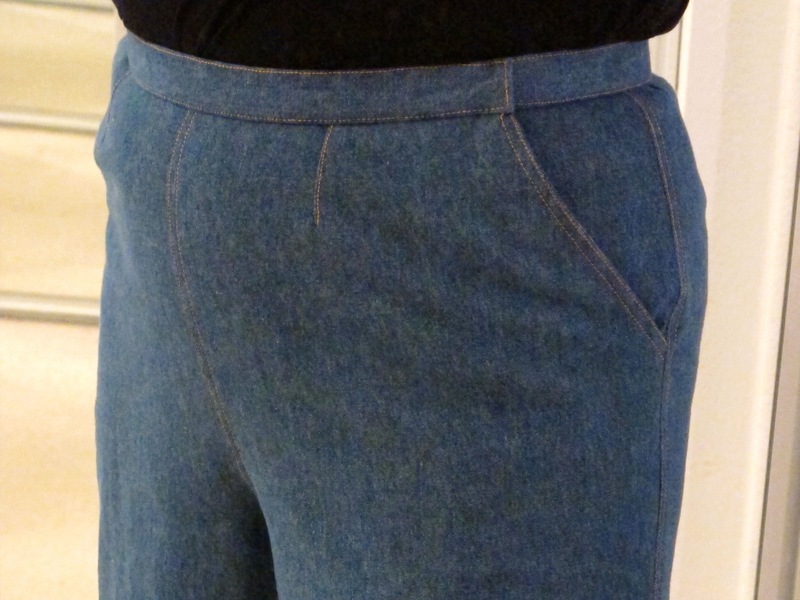 I do need to reduce the width into the waistband, but probably not where those darts are placed. Maybe just at the side seams. See the zipper hiding in the pocket? Crazy, no? 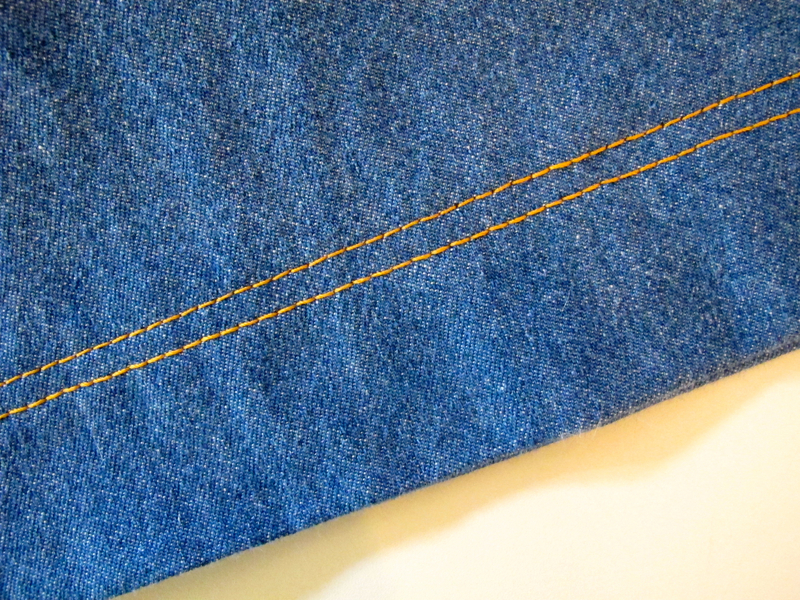 The construction was very straightforward, and I had some fun with the denim and topstitching. I was very pleased at how the Fancy Damn Sewing Machine handled multiple layers of denim. It had to pause and collect itself twice when I pushed it a little too hard, but other than that, it sailed through the project without a hitch. 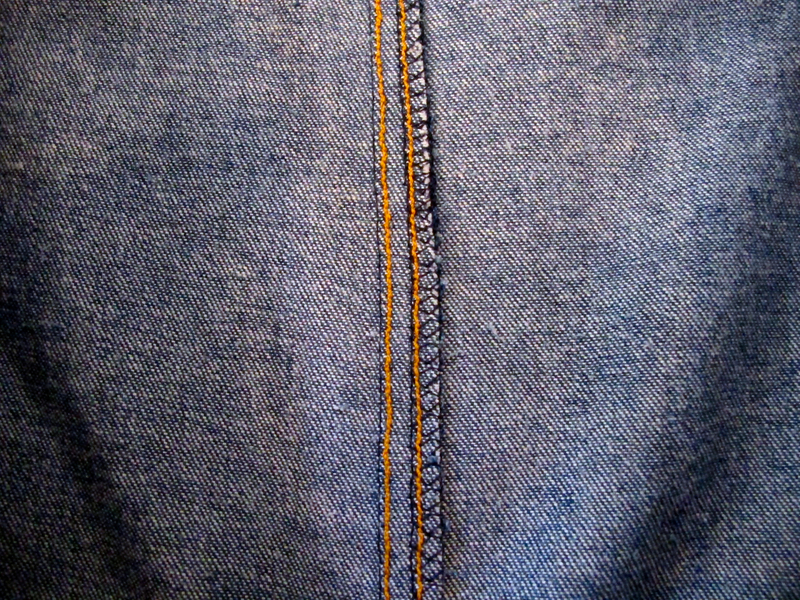 The faux flat-fell seam from the inside. 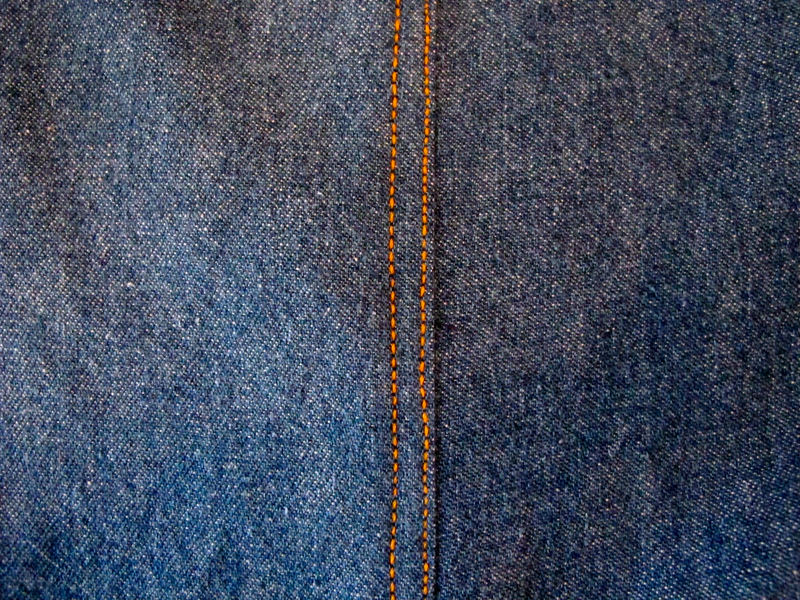 The faux flat-fell seam from the outside. I have never done a flat-fell seam before, faux or otherwise. It’s a great technique for finishing denim seams. And I was really pleased with the how the topstitching went. I did opt mid-project to buy a proper topstitching needle. It has a bigger eye for the bigger thread, so it prevented the shredding of the thread I encountered a couple of times. I used the appropriate gold topstitching thread and love the way it looks. It wasn’t until I got to the hem that I remembered to increase the stitch length, so that area looks best. I had purchased a nice brass button for the closure but wasn’t sure how well a buttonhole would sew through denim and the interfacing, so I chickened out and did a hook-and-eye closure. I really need to sew in another set for the underlap. All in all, it’s a successful project that just doesn’t fit as well as it should. Or perhaps as well as it will, as I’m back in weight-loss mode. I’ve lost five pounds since I fit the waistband. Who knows? Another 10 and it may fit great. It is a great wide-leg pattern, however. I look forward to solving the fitting issues and making it again in denim (lighter blue with red topstitching?) and dressier fabrics (the wool crepe in the stash). I may have to give more thought to the pocket and closure, however. I love the zipper in the pocket. I try to find pants or shorts that have side zippers but I hate losing the pocket. Wish I could sew. For now, I will stick with some shorts I found that have side buttons. I bought 6 pairs. Ooh, send me a picture of the pocket. I’ve seen that construction before, but not up close so that I could figure out how it’s done.